Back in 2009, Marya and I had taken Indigo up to Annapolis for a SSCA cruisier’s Gam. The four day event was essentially a large get together (100+ boats) anchored on the Rhone River with shore side activities, to include guest speakers and various classes. Overall, it was an awesome weekend and met a lot of cool full time cruisers and learned a lot. It took about 8 hours of tacking back and forth south on the Chesapeake to get back home, and once in the slip, Marya and I started to pull everything off of the boat. Marya decided to pull the sheets off of the boat and discovered that they (and the mattress) were soaked…with an unmentionable liquid concoction. With a mostly full holding tank and 8 hours of the boat bashing up and down in the waves, the tank (under the V-berth) leaked profusely with the mattress acting as a giant stinky sponge. Combine this experience with the fact that our holding tank is pretty small (15 gals) and that all of the hoses were beginning to smell. I started to rethink the head problem and began to open my mind to the composting head option. Initially, I didn’t like the idea at all, but the more I read and thought about it, the more I liked the concept. It doesn’t get much simpler, except for maybe a bucket or porta-potty, but that was a little too simple and the Admiral would never approve. We ripped out the old head and all of the old hoses which was a really crappy job (can’t resist the pun). The holding tank on the PSC is molded into the liner and then a fiberglass lid is screwed on top. We removed the lid and spent a couple of days cleaning and disinfecting the tank. 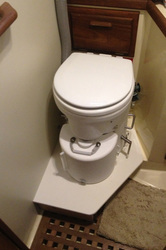 With the removable lid, we now gained a good size storage compartment for toilet paper. After going back and forth between the Airhead and Nature’s Head we went with the Airhead because I believed the dimensions would work better on our boat. The installation itself is pretty straight forward, but I had to install the dodger mounted solar panels first to power the small ventilation fan. Many people use a solar vent for this purpose, but I didn’t want to drill another hole in the boat and the solar vents are not water proof when waves crash over the deck. 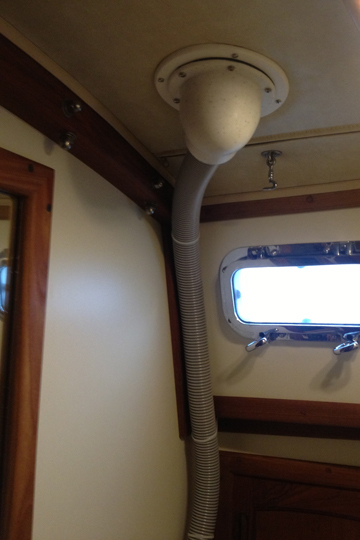 We already had a dorade-type cowl vent in the head and I thought I would plumb the air vent to the dorade, eliminating the need to drill a hole. 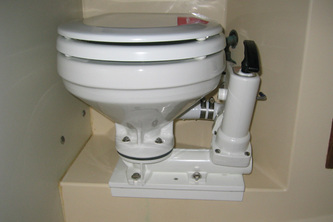 Plus, the cowl vent can be closed easily up on deck in really rough weather. To install the fan shroud provided by Airhead, I removed the old cracked Vetus cowl ring and made a new one out of ¼ inch Starboard. The center hole was made a little smaller than the original in order to provide a mounting surface for the fan vent to screw into. 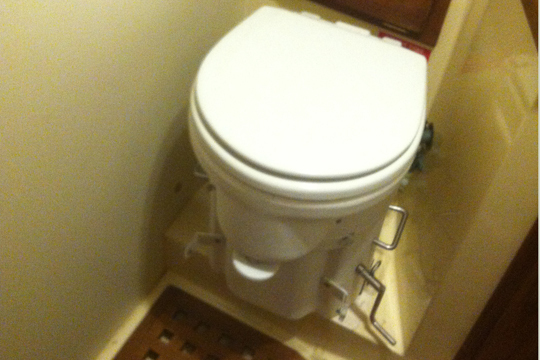 Also, due to the height height of the head, I had to make a platform which also allows your feet to sit on while seated on the loo. You can see the difference in the top before/after photo...it's quite a bit higher. Your feet will not touch the floor while seated without such a platform.
. The hardest part was running the wires from the head all the way back to the batteries. The fan is run directly off of the batteries, and not through the main DC switch, so that it can run 24/7 similarly to a bilge pump installation. Hopefully, it will live up to our expectations. Follow up in the future. Vent hose into original dorade opening.